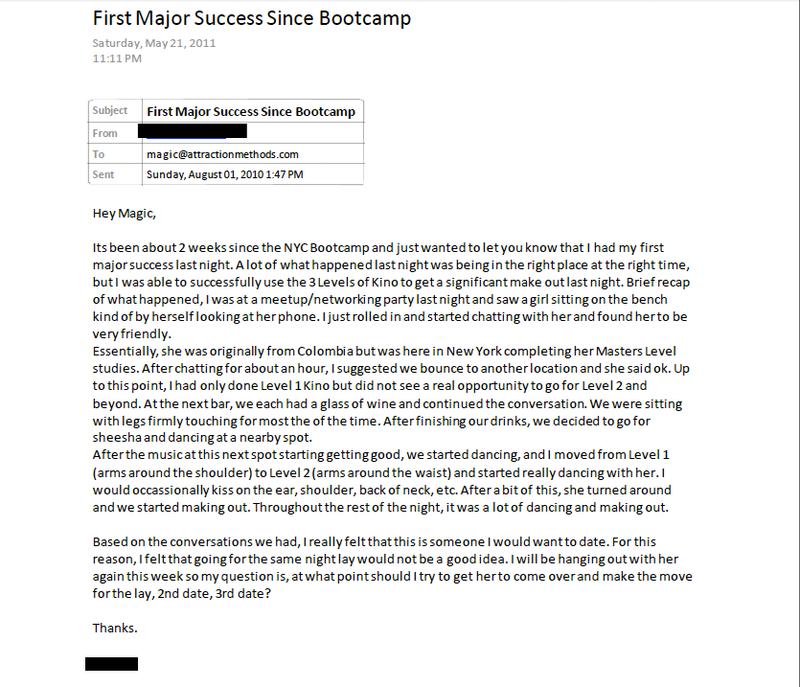 Its been about 2 weeks since the NYC Bootcamp and just wanted to let you know that I had my first major success last night. A lot of what happened last night was being in the right place at the right time, but I was able to successfully use the 3 Levels of Kino to get a significant make out last night. Brief recap of what happened, I was at a meetup/networking party last night and saw a girl sitting on the bench kind of by herself looking at her phone. I just rolled in and started chatting with her and found her to be very friendly. Essentially, she was originally from Colombia but was here in New York completing her Masters Level studies. After chatting for about an hour, I suggested we bounce to another location and she said ok. Up to this point, I had only done Level 1 Kino but did not see a real opportunity to go for Level 2 and beyond. At the next bar, we each had a glass of wine and continued the conversation. We were sitting with legs firmly touching for most the of the time. After finishing our drinks, we decided to go for sheesha and dancing at a nearby spot. After the music at this next spot starting getting good, we started dancing, and I moved from Level 1 (arms around the shoulder) to Level 2 (arms around the waist) and started really dancing with her. I would occassionally kiss on the ear, shoulder, back of neck, etc. After a bit of this, she turned around and we started making out. Throughout the rest of the night, it was a lot of dancing and making out. Based on the conversations we had, I really felt that this is someone I would want to date. For this reason, I felt that going for the same night lay would not be a good idea. I will be hanging out with her again this week so my question is, at what point should I try to get her to come over and make the move for the lay, 2nd date, 3rd date?